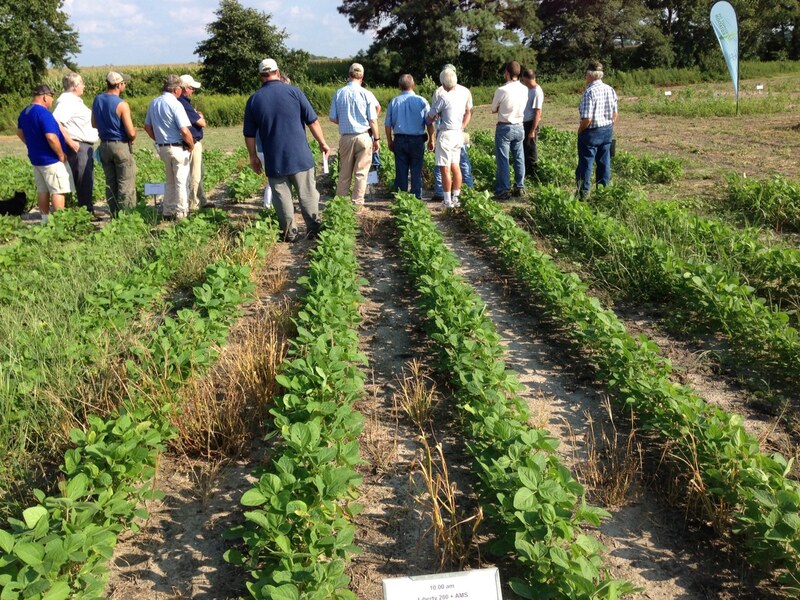 On August 22, The University of Delaware Cooperative Extension in collaboration with Bayer CropScience, and the Delaware Soybean Board held a field day to highlight ways to better control weeds without pushing weed resistance to herbicides. 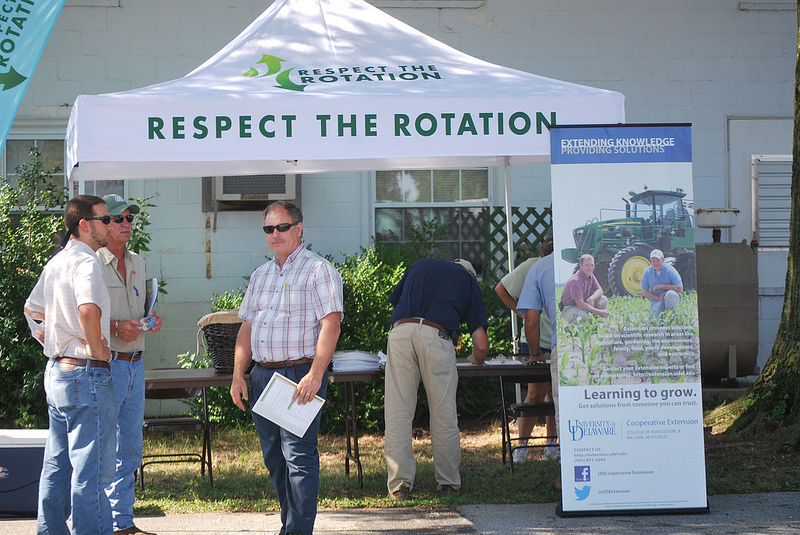 The “Respect the Rotation” tour was held at the Thurman Adams Agricultural Research Farm, part of the Carvel Research and Education Center, the Georgetown-based campus of the College of Agriculture & Natural Resources. The Respect the Rotation program is developed by Bayer CropScience and seeks to elevate the adoption of herbicide diversity through the implementation of three practices: rotation of modes of action – how herbicides are applied, rotation of crops and finally, the rotation of herbicide-tolerant traits. Mark VanGessel, Extension weed specialist and professor in the Department of Plant and Soil Sciences welcomed approximately 60 registrants, most of whom were Certified Crop Advisers, agriculture industry professionals who take what they see and learn directly back to growers. Two hours of perfect weather on Thursday afternoon provided an ideal opportunity to examine actual Delaware weed control challenges and success in agronomic crops that are important to the First State, such as soybeans and corn. Resistance in plants is a natural and inherited ability of a plant, in this case a weed, to withstand and survive herbicide treatment that would otherwise kill or successfully control growth. One cause of resistance build up is not using herbicides according to their label, or at a weakened strength, VanGessel said. 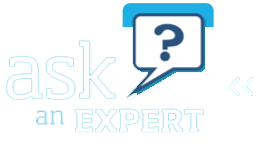 In order to stay ahead of the challenge, crop advisers and growers need to understand weed biology and seed production and be encouraged to prepare clean fields and employ the principles of Integrated Weed Management. Noxious weeds, such as Palmer amaranth, which is glyphosate-resistant, were seen to thrive in certain UD test plots, but not in others. A prolific seed producer, Palmer amaranth has the potential to cause serious economic damage to Delaware’s agronomic crops. What makes a difference in controlling such weeds is the timing of the herbicide application, whether the herbicide is pre or post-emergent, and knowledge of the specific herbicide recipe or mode of action that was used in each application.At the college’s experimental station in Georgetown, each plot is marked with the time of day the herbicide was applied and the specific herbicide product(s) that were used. 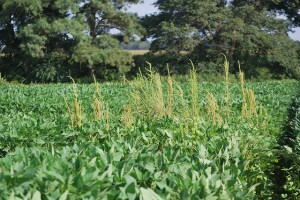 The University of Delaware offers additional recommendations to control weeds; suggestions for herbicide mix partners, the correct time to apply, in Palmer amaranth’s case, when the plant is less than three inches tall, and encourages effective burndown herbicides or tillage and other cultural practices. During the tour they were able to observe soybeans that had developed a triple-stack tolerance to Liberty, glyphosate and HPPD-inhibitor Balance. Multiple research trials are underway in Georgetown. 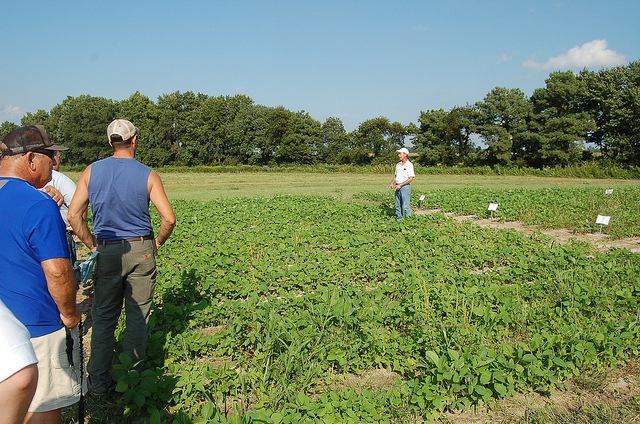 One trial sponsored by the Delaware Soybean board looks at different approaches for no-till soybean. Two applications were applied before planting, VanGessel said, which controlled several weeds such as mare’s tail and primrose. “At planting, we already hit weeds with five modes of action – from a resistance management standpoint, four weeks after planting, post-emergence herbicides were applied. Multiple modes of actions at multiple times.” Part of the study will look at seasonal weeds and using cover crops. “We are looking at different scenarios for fall applications to control winter annuals,” VanGessel said. In addition to VanGessel, co-presenters included Dr. Ron Ritter, University of Maryland Extension weed specialist, emeritus and representing Bayer CropScience were Dr. Matt Mahoney, tech service & field development and Jeff Springsteen, marketing manager for corn herbicides. Please click on the Respect the Rotation photo gallery for additional pictures of the tour. 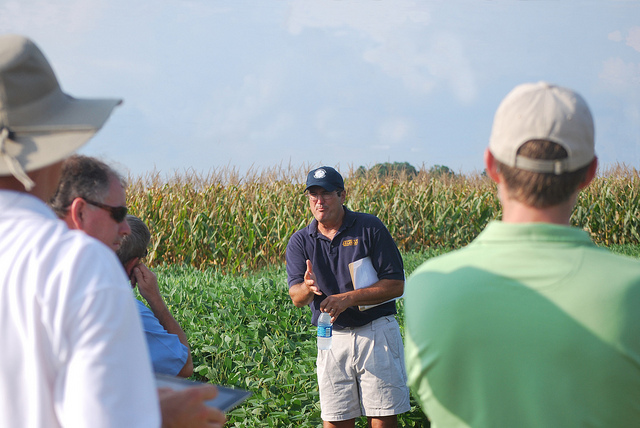 Throughout the summer and growing season Delaware Cooperative Extension shares ongoing research by offering several agricultural-related field tours to agriculture stakeholders. Continuing education credits are made made available during these tours.